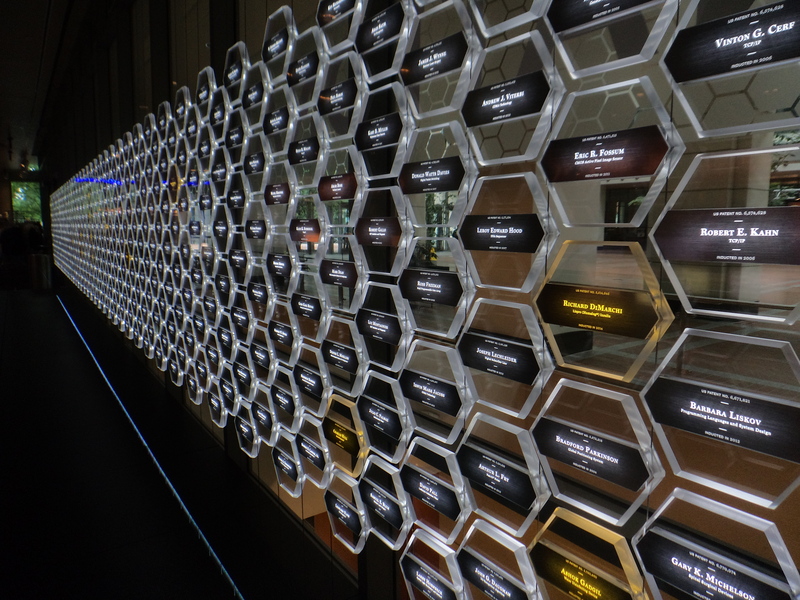 The National Inventors Hall of Fame Museum in Alexandria, Virginia. I will never be a Hall of Fame inventor, but one thing I do know is that creative thinking is not bound by application. In other words, the secret sauce of creative thinking that produces a great painting or opera is little different than that which leads to a groundbreaking new drug or consumer electronics device. So let’s learn together some secrets of creative thinking from great inventors. Keep it simple: Ernest Hemingway’s prose contains few extraneous words. Steve Jobs’ designs contained few extraneous interfaces. And 2014 Inductee Ashok Gadgil‘s water disinfection device contains few if any extraneous parts. This is critical, he told me, because while we have long known how to rid contaminated water of disease-killing pathogens, the devices well-intentioned developed countries were providing impoverished villages in developing nations would require maintenance that it was unreasonable to expect the villagers to perform. “You don’t have a Phillips screwdriver in these villages,” he told me, “and you certainly don’t have an Ace Hardware.” So Gadgil–who growing up in Mumbai knew the horror that contaminated water could bring–worked to develop a product that had no moving parts, was extremely lightweight, could serve as many as 1,500 people, and because it uses less electricity than a light bulb could be powered by wind or solar or even a bicycle. Gadgil’s creative genius was in stripping away extraneous details and reducing his invention to beautiful simplicity. 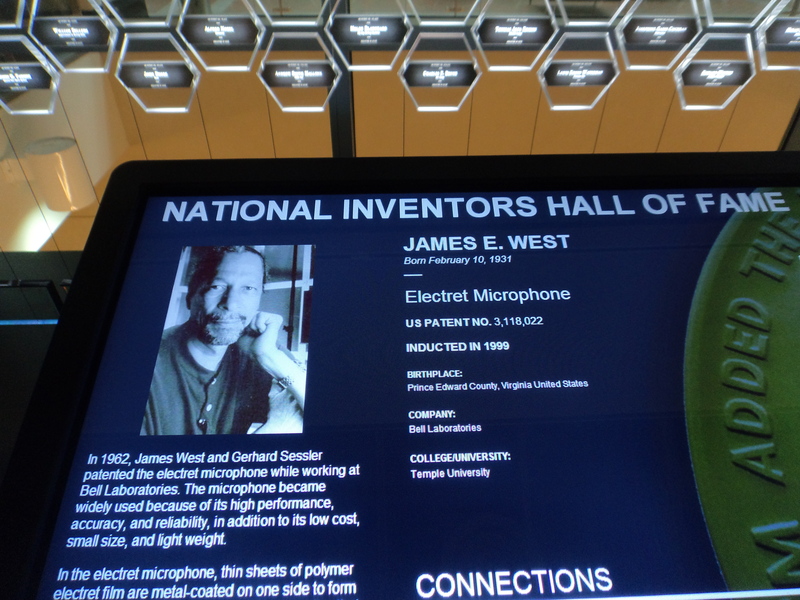 Interactive displays of some of the 2013 NIHF inductees. Rethink what’s possible: Sometimes creative thinking doesn’t involve an improvement on an existing solution, but solving a problem many assumed wasn’t solvable. That’s what 2013 Inductee Garrett Brown did. To talk with Brown is to experience someone whose mind seems in constant motion, which is exactly what his Steadicam is all about. Brown observed that because motion picture cameras were too heavy and bulky to be carried while filming, movie viewers were being denied the ability to follow a subject through the action. Others in Hollywood did not see this absence because they assumed a solution wasn’t possible. Brown disagreed, and created a body-mounted stabilization device that absorbs motion. Brown didn’t just invent the stabilization camera, he also served as the cameraman, giving us iconic scenes such as Rocky’s run through Philadelphia. Brown is still inventing; he showed some of us his latest invention, a pocket-sized stabilization device that folds out to hold your smartphone. He thus plans to put in our hands the power of today’s Hollywood. Don’t limit your thinking: As a young engineer at Kodak in 1974, 2011 inductee Steve Sasson was asked to spend some time with something called a charge-coupled device to see if it could help cameras sense an image. He took it a step further, envisioning a photograph that could be taken not on film–Kodak’s bread and butter–but purely in pixels. A year later he had invented the first digital camera, and demonstrated his technology by photographing his co-workers at a resolution we would now call 0.1 megapixels. Of course many of us know how this ended. The thinking of Sasson’s employer was more limited–focused on existing profit from film rather than future profit from digital photography–and the company is no longer in business. Sasson is remarkably humble in person; you would never realize you were speaking to someone who completely upended an industry and changed the way we interact with the world. But of course Sasson’s breakthrough is something we carry around with us every day, in that smartphone we soon will be clipping into Garrett Brown’s portable Steadicam. The awe-inspiring Gallery of Icons. Be persistent: The patent is for “stereolithography.” The technology is known in geek circles as “additive manufacturing.” We know it as “3D printing,” and the inventor is 2014 inductee Charles Hull. A warm and generous man–he gave everyone attending the induction dinner 3D candies that tasted almost as good as they looked–he also is a classic example of how overnight successes actually involve a lot of nights and a lot of failures. Like Sasson, he was encouraged by his employer to play around with an idea he had–in this case using ultraviolet light to “print” manufacturing prototypes–but unlike Sasson, he was still expected to do his day job. So Hull spent nights and weekends in his basement experimenting. He needed a material that could be soft enough to be run through his “printer” onto his growing “printout” but would harden quickly enough and be strong enough to be usable. One night he finally achieved it with a form of photopolymer, and dragged his pajama-clad wife out of bed to see the result. Learn more at the interactive kiosks. There are more than 500 NIHF inductees. 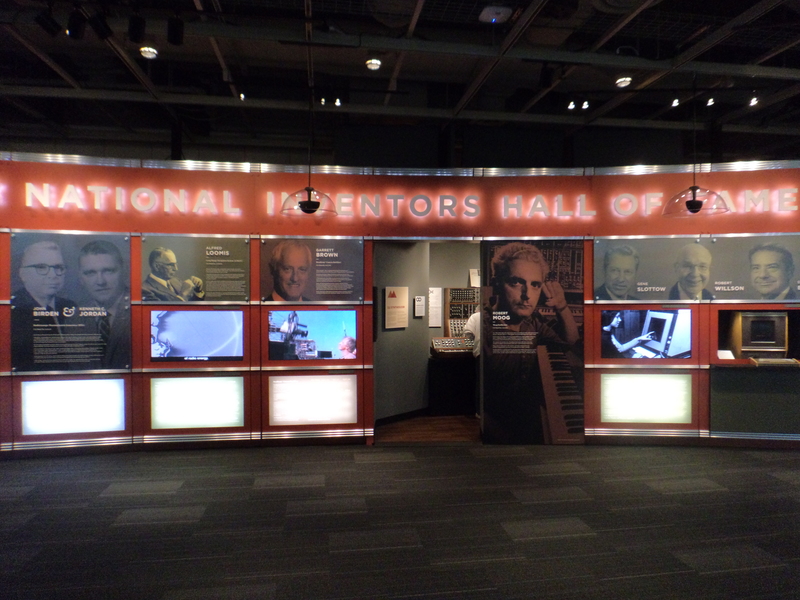 You can learn about each and every one of them online or at the National Inventors Hall of Fame Museum in Alexandria, Virginia, housed at the U.S. Patent and Trademark Office. At the museum re-opening ceremony last month, each of the individuals mentioned above–as well as many other past and present inductees–placed their names on their corresponding icon in the Gallery of Icons. 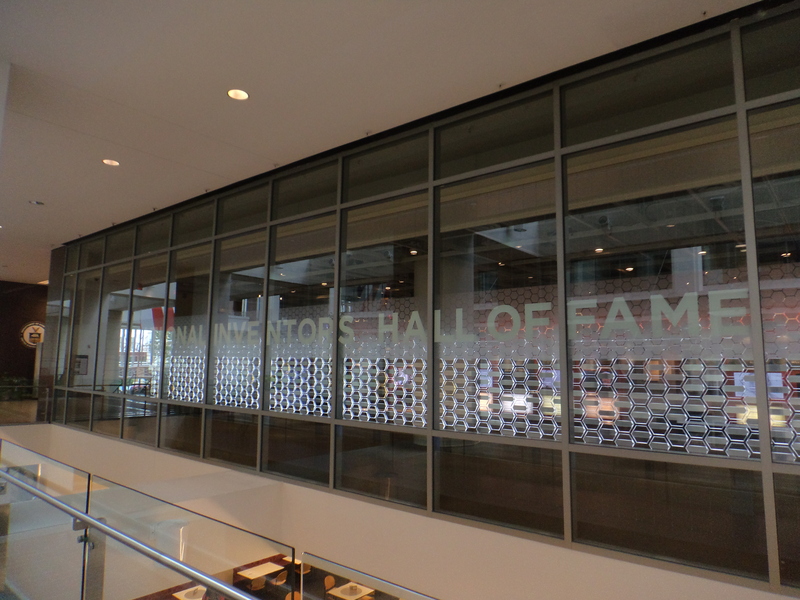 Kiosks to the left and right of the Gallery allow you to learn more about each and every inductee, and interactive exhibits offer insight on how creative minds have changed our lives for the better. I referred above to Chuck Hull’s day job; well, part of my day job is working with the National Inventors Hall of Fame Museum. So if you plan to visit, let me know and I’ll greet you! Inventiveness and creativity are inherently the same, both of which I know are certainly an innate part of me, so I’m more than drawn to the topic. It’s one of the reasons I’m looking forward to reading YOUR book. I’m so glad to have this resource now and, as usual, enjoyed your post. Wonderful stuff! Yes, the museum is part of my day job; in fact my office has a connecting door to it. I was fortunate enough to play a small role in its redesign, and will going forward with future exhibits we’re looking to install. It’s pretty fun! Patrick, I HAVE to ask: is it your passionate interest in creativity and creative people themselves that lent you to have a job like that, or is it the job that fuels your increased passion for the creative life? Patrick, great post and really informative. Creative thinking is such a pleasurable thing and, if I may say, a little under-rated. ‘Taking a trip and never leaving the farm’ was a line coined in one of Roger Miller’s classic hits, and it is something that I have enjoyed playing over in my head for many years. Some of the best ideas I have had, have been at night, in dreams or in the morning shower. It seems that when we remove the daily pressure to perform, then our creative juices are invited to flow.B. Yes on removing the daily pressure! And yes on the shower, by the way. There have actually been studies that show we have some of our most creative thoughts in the shower because we know there is no way whatsoever we can engage in any other activity at that moment, say, checking our tweets on our smartphone. It’s one of the few moments when our subconscious can talk to us (along with at night or in dreams), and we’re always cooking up creative stuff in our subconscious without even realizing it. Thanks for a fascinating write-up of some amazing conversations with extraordinary people! Really enjoyed it, and it’s great to know that these accomplished inventors are still, essentially, inventors–there seems to be no “off” switch, nor would they want one! Thanks for sharing. No “off” switch, that’s a great way of putting it! It was also exciting to see how they remain enthusiastic about what they’ve done, even though they’ve all moved on to new challenges. I peppered Ashok with about a thousand questions, for example, and he just rolled with it. Based on my experience interviewing artists, I know it’s tempting for creative minds not to look back, because creatively now their mind is someplace else. But it’s such a gift for them to let us take them back to those creative moments for which they are being celebrated. Thanks for sharing this, Patrick. I keep scrolling up to look at that photo of the gallery of icons; apart from it looking like a beautiful piece of modern art, it blows my mind to think that every one of those shiny hexagons represents a brilliant, creative person who really exists. I can’t even imagine what it must be like to spend an evening in a group of such amazing people – an episode of some futuristic sci-fi series come to life, perhaps? 😉 And yet at the same time they all sound like such modest, unpretentious people – who give great advice to the rest of us. The job has its moments, that’s for sure! At least once a year at induction; this was my third. The remarkable thing is how unpretentious they are. But it’s also fascinating to watch them interact with each other. They are obviously in a very exclusive club. Probably about half of those icons represent inventors who have passed, some recently and others not (think Edison). These individuals understand the world in a way to which others of us only aspire, and thus they understand each other as well, even if they know little about the scientific fields the others practice in. Thanks for these great insights, Patrick. A lot of the advice is familiar but since it comes from the Hall of Fame inventors you interviewed, they definitely require new consideration. What a fantastic opportunity it must have been to speak with all these people. Thanks, Joe! Of course sometimes the best advice appears obvious to us; what is less obvious is why we’re not consistently applying it to our own lives. I appreciated this information. Thanks, Patrick.